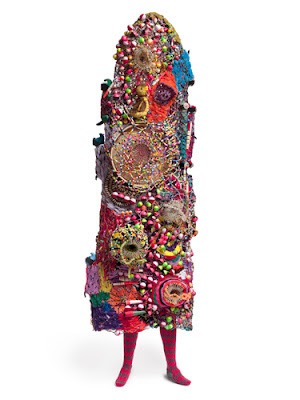 goARTkids: Nick Cave: "SoundSuit," "Speak Louder"
Nick Cave: "SoundSuit," "Speak Louder"
Almost as if in anticipation of the costume parades and parties that will capture our children's imagination next month the awesome "SoundSuits," of the artist Nick Cave are in display in concurrent exhibitions at the Jack Shainman Gallery and Mary Boone Gallery (just four blocks from each other) in Chelsea. Mr. Cave has been making this wearable art as a way of exploring many issues that are skin deep. In creating a second skin he asks the viewer to judge the wearer of the costume only by what he has chosen to let us see. 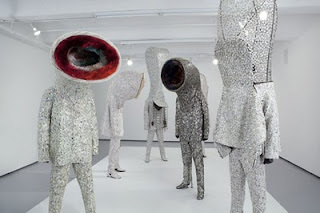 Although we can't hear the sounds that can be made when wearing the costumes they can be seen and heard in a video that plays continuously in the Boone gallery (see below). The exhibition at the Jack Shainman gallery is entitled "Ever After" The costumes are sleek, monotoned and look like a cross between aliens and musical instruments. The mood at Boone gallery is more like that of a Mardi Gras parade as the costumes scream with colorful buttons, thread, wire ,sequins, bugle beads and much more. The exhibit is entitled "For Now." Both shows are perfect for all ages.